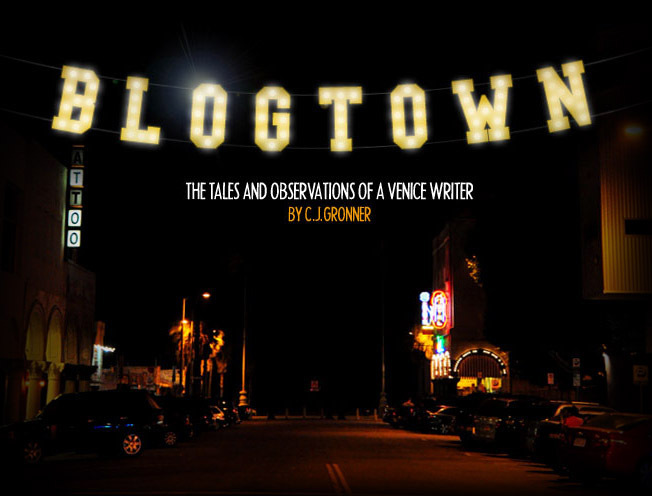 Blogtown: Vinny's - Cheesesteaks At The Beach! Yo! This one goes out to all my Philly friends. 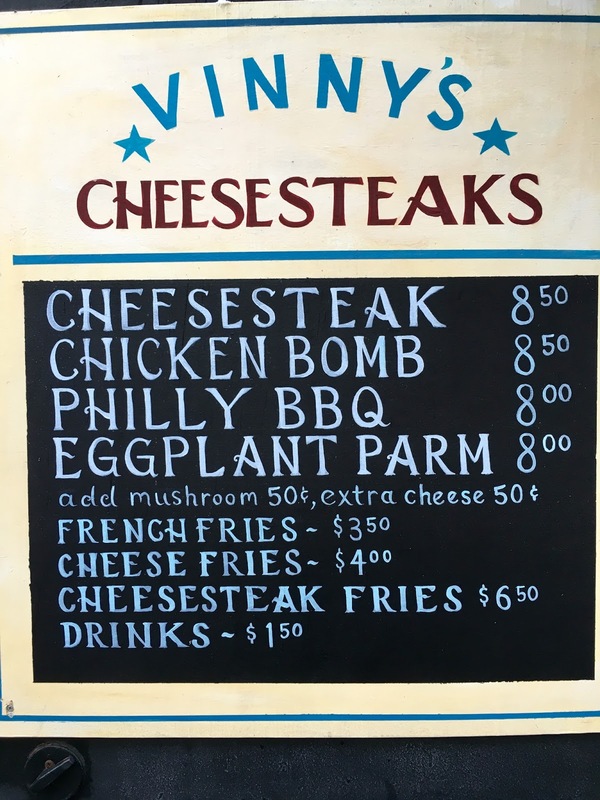 Now you can get your cheesesteak fix at the beach at Vinny's! That's right, Vinny's on Westminster and Ocean Front Walk is coming up on their one year anniversary of serving awesome cheesesteaks out of their little window, so I thought it was high time to get to know the people behind it ... namely Vinny. Vince Zangari grew up in Lancaster, PA in Pennsylvania Dutch territory, where his Dad, Ronald, opened up a restaurant after the Korean War in the 1950's. 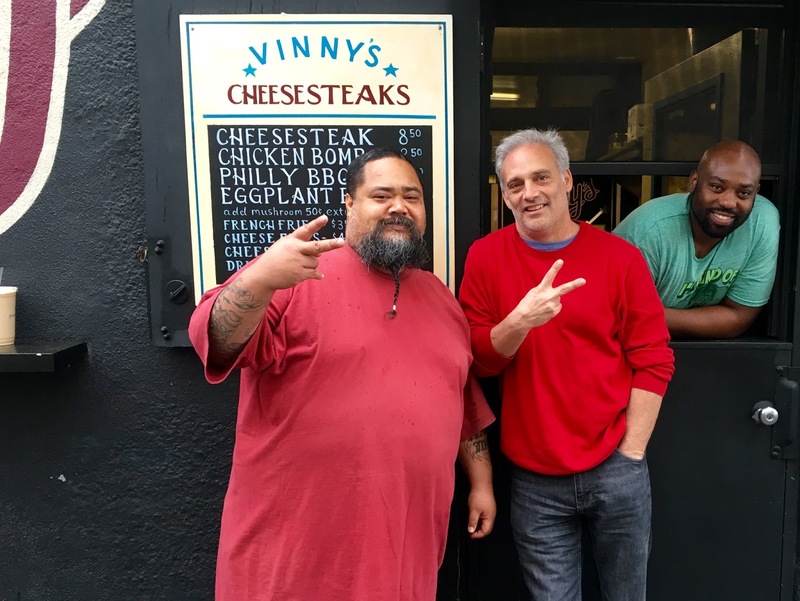 He did cheesesteaks (his own way) so folks didn't have to drive to Philadelphia. As one of 15 kids in their massive Italian family, there was always family involved in the business, and Vince worked there all through high school. After attending Temple University and F.I.T. in New York, Zangari got a gig with Armani, which led to acting, which brought him out here to the West Coast. He had a family, and that kept him here, acting, but also working at restaurants all the while. Zangari then met Greg and Yunnie Morena, whose family had owned Santa Monica Pier Seafood (on the Pier) since 1977. When the Morena's took over for Yunnie's father, they revamped the place, renaming it The Albright. Zangari became the VP of Operations, and when The Albright began doing the food program for the Pier Concerts, Morena encouraged Zangari to do a tent with his family recipe cheesesteaks. It blew up immediately, with crazy lines and the crew serving 400 steaks an hour. 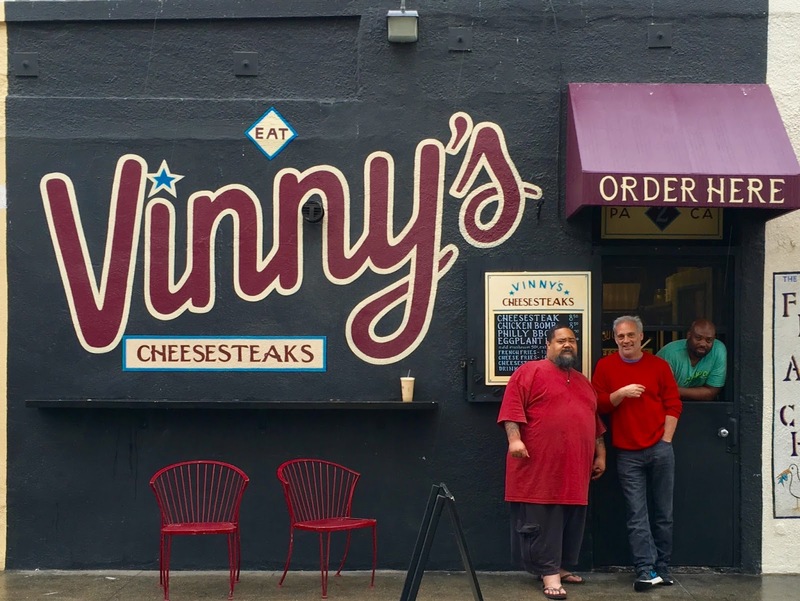 Soon thereafter, Morena noticed there was a space available on Westminster, and with the success at the Pier Concerts, urged Zangari to open a cheesesteak place, and now we have Vinny's! Vinny's cheesesteaks are done their way, which means hand-sliced in house beef ("eye of the round"), white American cheese (not Cheez Whiz, but they do have that kind of stuff on hand should they encounter a diehard who believes that's the way), mushrooms and onions (not peppers, and you can't get those), delicious Amoroso bread shipped in from South Philly, and their family recipe sauce. 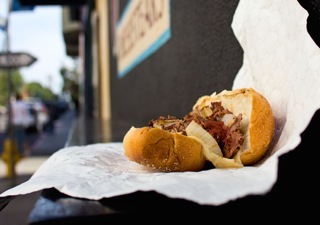 (I'm a real plain Jane with my sandwiches, so I take mine with just meat and cheese, and it's sublime). You can also get a chicken one, and eggplant parm, and pulled pork, but I'm pretty partial to that steak. Though Zangari, in all honesty, had some trepidation about operating out of a space at the Boardwalk, thinking it was maybe too crazy down here, that soon dissipated when the surrounding merchants and neighbors immediately embraced them. There is a man named Vinny who is always down on Westminster playing guitar, and he had to leave town when his mother died. Neighbors originally thought the big new "Vinny" painted on the wall was in tribute to guitar Vinny, so automatically thought this new place was cool. Which it is. 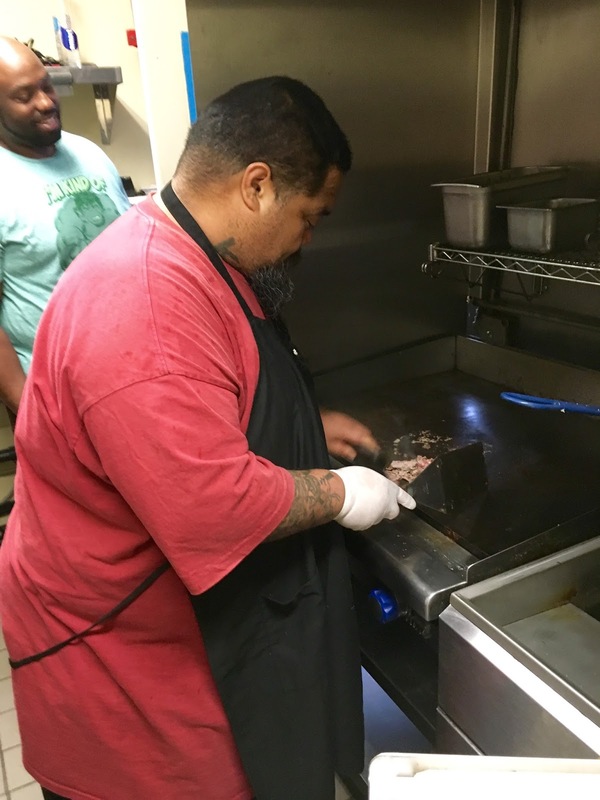 Zangari loves serving the locals, and realizes that they are his bread and butter. They deliver sandwiches to the Boardwalk vendors (at a discount! ), the skatepark kids line up to chow down, and Vinny's regular customers are now also friends. "I'm really grateful to have the opportunity to have a business on the world famous Venice Boardwalk," says Zangari. "I didn't know what to expect, and we were accepted by the community from Day One. Locals have always been our focus." We sat and watched the world going by (Literally. People from all over the world in like an hour), and Zangari truthfully said, "There's no place like it. It's so unique - in good AND bad ways. Where else do you have such homelessness, and such money, all melting together in the middle, co-existing?" Nowhere. "Yeah, there's change, but I was here 20 years ago, and the essence doesn't change. I still have the same energetic feeling I had 20 years ago. The PEOPLE are what makes it Venice, right?" Right. "My family is East Coast multi-generation, so I understand and respect history... and am grateful to now be a part of the Venice history." That's the attitude that locals can understand and respect, and certainly appreciate in a time where the unique charm of Venice is being so threatened by less respectful/more greedy parties. Vinny's is manned most days by Zangari's trusted Boom Boom, a local guy that Zangari wanted to help set up with a business. "I'm interested in investing in people," says Zangari. Also certainly appreciated. Served with a smile by Boom Boom and Lawrence, working out of their extra-tiny kitchen, I think it was the best cheesesteak I've had outside of Philly.